Epithelium – respiratory epithelium – columnar cells have gradual decrease in height, cilia & goblet cells. Lamina propria – gradual decrease in thickness & increase in number of elastic fibres. Glands – mucous & serous glands . 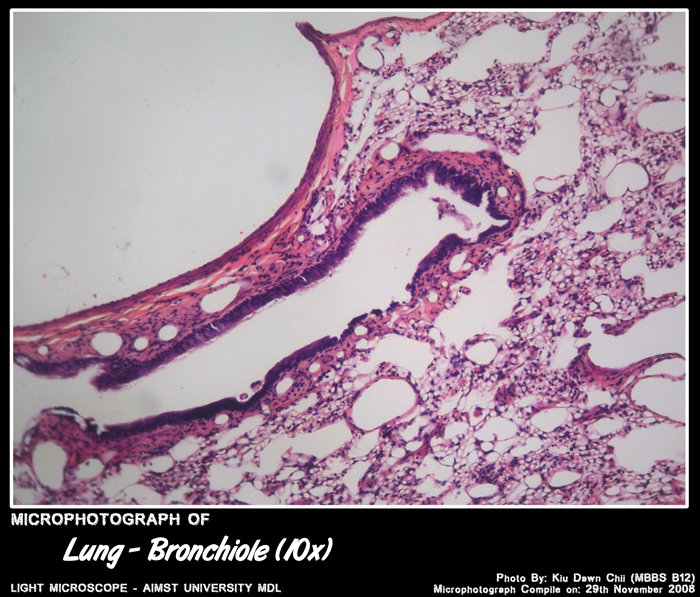 Skeletal connective tissue – complete rings in primary, plates of cartilage in smaller bronchi. Muscle – several layers of circular smooth muscle. Epithelium – Simple columnar with cilia & goblet cells. Skeletal connective tissue – none. Smooth muscle – decreasing numbers of smooth muscle cells. Epithelium – Simple cuboidal cilia free cells named Clara cells , some cells ciliated, goblet cells rare. Epithelium – Low cuboidal, with few cilia; no goblet cells. Epithelium – some low cuboidal, no cilia. Epithelium – mostly simple squamous (type 1) – some low cuboidal ( type 2 ) in septa. Lamina propria very thin with interstitium rich in capillaries & elastic fibres. 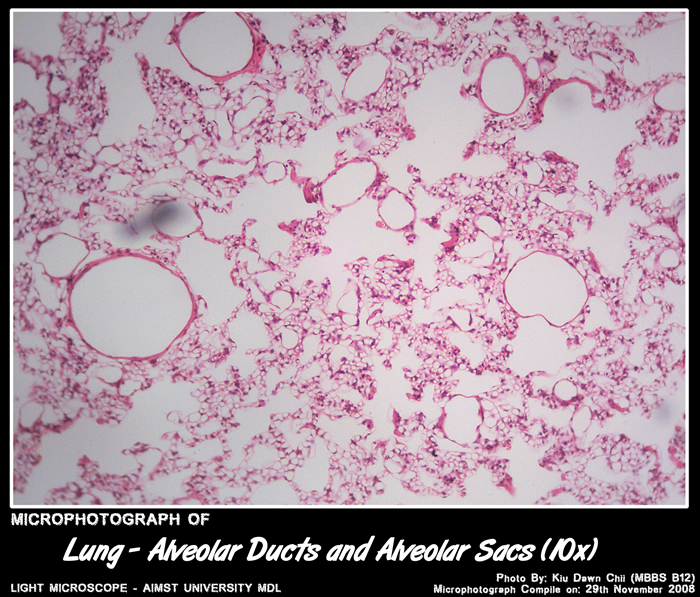 Micro-photograph taken at AIMST University Multi Disciplinary Laboratory during Histology class, using Canon A40 camera over light microscope. This entry was posted in Year 2 Histology and tagged histology. Bookmark the permalink. . Print .